Transferred to Data File Formats - MP4, MOV, AVI, etc. 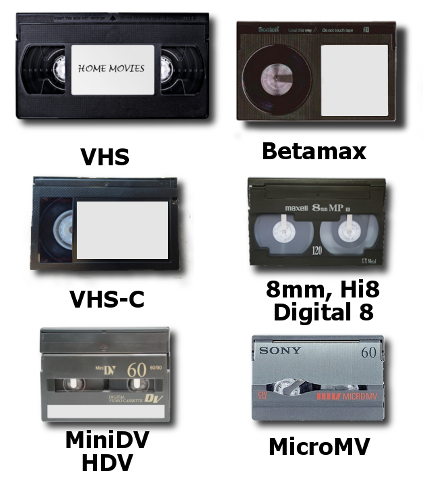 Video Tapes digitized and reformatted to new digital file outputs, priced by content hour. This option is ideal for tape libraries with many tapes, but with only minutes of content on each tape. We offer conversion to a selection of new digital formats such as DVD, Blu-ray Disc, or data file formats. If optical disc (DVD or Blu-ray) is chosen, we will combine the content onto as few discs needed as possible. If data file formats are chosen, several options exist for return of the new digital files - via data disc, flash-drive, external hard-drive, or web download. Pricing is $40.00 per video content hour. Estimate the number of hours and enter this number in the QUANTITY box above. We do not charge your credit card until your order is complete and ready for return shipment. If your estimate is high we will reduce the dollar value of your order. If your estimate is low, we will first contact you with information on how many content hours are in your video tapes, provide a new dollar estimate, and wait for your instructions to proceed. Shipping and handling (S&H) is FREE on orders with a dollar value of $100 or more. S&H is $7.50 on orders valued between $50 and $100. S&H is $25 on orders less than $50 in value. A shipping label from UPS is provided for your inbound package after submittal of your order.